Bespoke Innovations isn't your average design firm. The young company is creating stylish accessories for a demographic often left behind by the fashion world: amputees. Founded in 2010, the San Francisco-based firm creates "fairings" -- intricately designed panels that fit over prosthetic legs. The fairings create a shell around the traditional prosthesis, giving the mechanical limb a more natural shape. The company uses 3D scanning and printing technology to create the most accurate dimensions for the panels, which are produced to mimic the size and contours of the customer's sound leg. The fairings are then personalized with etchings, embellishments, even tattoo designs to reflect the client's personal style. Made of lightweight polymer, chrome or leather, Bespoke's panels are the first of their kind. "We avoid the competitive nature of the healthcare world by exploring areas where no other company has explored," said Scott Summit, founder, chief technology officer and industrial designer of Bespoke. "There is nothing at all like a 'fairing' in orthopedics today, so we have no competition to speak of." Summit began experimenting with prosthetics five years ago before teaming up with Ken Trauner, a Harvard-educated orthopedic surgeon. The pair received a small round of series A funding in 2009 and got started fitting eager customers. Bespoke has worked with many victims of motorcycle accidents as well as a growing number of veterans. "Many of the soldiers we work with are ideal candidates, since they're often younger, full of personal style and eager to show the world their new hardware," Summit said. "We're constantly amazed by the resilience that we see in people and their determination to drive forward despite often brutal physical loss." 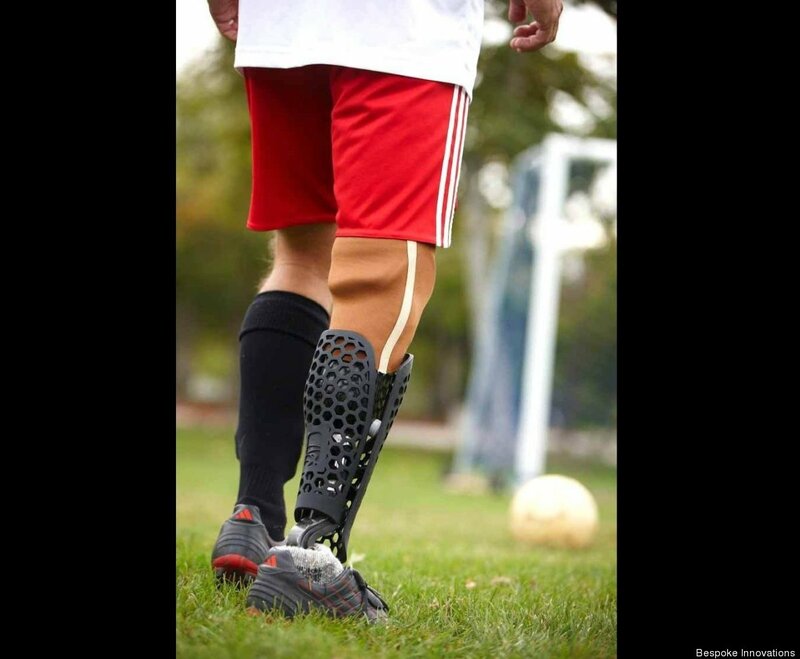 The durable panels, which snap on and off the prosthesis for easy care, are capable of fitting every lifestyle, allowing customers to regain a solid sense of physical normalcy that is often pushed aside by current prosthetic design. The fairings, which can cost between $4,000 to $6,000, are not yet covered by insurance, but Bespoke is hoping to work with prosthetists in the future to change that. While Bespoke only currently creates prosthetic leg panels, Summit and his team aspire to much more. "We'll be working with companies that are working with more complex physical challenges in order to improve the overall quality of living for the user. I hope to be able to offer complete, functional prosthetic legs to people throughout developing countries at some point." Active Bespoke client Chad was diagnosed with cancer and chose to have his leg amputated in 2004 at the age of 33. The avid athlete took his new condition as a challenge, signing up to be on the CBS reality show "Survivor" just a year later. Since then, Chad has engaged himself in the Challenged Athletes Foundation, competing in wake and snowboarding, BMX biking competitions and triathlons. Chad has a special Sport Fairing for soccer that has a built in shin guard, but his favorite is his leather fairing.